BIG SALE!! 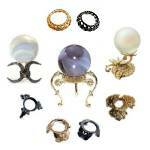 GEMSTONE SPHERES 2" SPECIALS BIG SALE!! Onyx is banded agate displaying straight and parallel bands of alternating colors. It belongs to the Chalcedony family of quartz and comes in a surprising array of natural colors from pale to deep greens and browns. 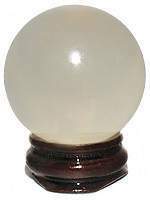 Beautifully polished 2" sphere from Pakistan comes with an Oriental Wood Stand. Onyx is banded agate displaying straight and parallel bands of alternating colors. It belongs to the Chalcedony family of quartz and comes in a surprising array of natural colors from pale to deep reds and browns. 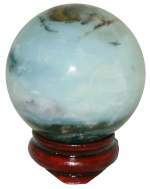 Beautifully polished 2" sphere from Pakistan comes with an Oriental Wood Stand. 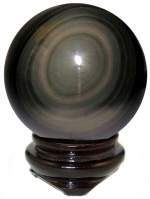 Rainbow Obsidian is a classic gazing stone. Believed to bring Love and Light into one's life. What secrets will it reveal? Beautifully polished high shine 2" Spheres from Mexico. The Oriental Wood Stand is included. Sheen Obsidian is the most captivating of gazing stones, because of the sensational shine. This natural volcanic glass has been used by shamans to reveal secrets for centuries. 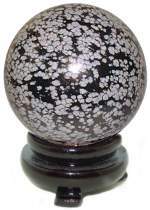 Rare, extra quality, polished 2 1/4" Spheres from Mexico have the Oriental Wood Stand included. 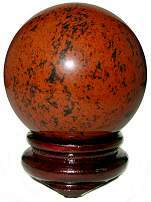 Mahogany Obsidian has a reddish brown matrix with splashes of black color. It is definitely an eye catcher! This natural volcanic glass, mostly found in Mexico, has been used by shamans to reveal secrets for centuries. Beautifully polished 2 1/4" obsidian spheres from Mexico. The Oriental Wood Stand is included. Obsidian takes on Snowflakes when a white mineral Phenocryst is present. It is a stone of purity, bringing balance to body, mind and soul. Beautifully polished 2" Snowflake Obsidian Spheres from Mexico. The Oriental Wood Stand is included. Madagascar AA Girasol Opal Quartz has a vitreous translucency which looks like light passing through a thin veil or frosted glass. Opal is composed of silica and water, which gives it the illusion of water captured in stone. 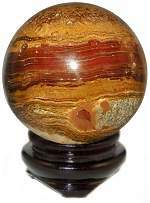 We have a limited quantity of these rare Madagascar spheres, order yours today! The Oriental Wood Stand is included. Girasol Opal Quartz has a vitreous translucency which looks like light passing through a thin veil or a clear frosted glass. Opal is composed of silica and water, which gives it the illusion of water captured in stone. 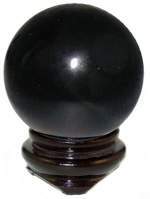 We have a limited quantity of these rare spheres from Madagascar, order yours today! The Oriental Wood Stand is included. 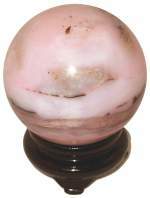 Exceptional translucent Pink Opal spheres from the Andes of Peru. Pink Opal has a soothing combination of pink and lavender swirls. This stone has been associated with rebirth and awakenings. It's possessor is believed to enjoy heightened creativity and spirituality after being released from past negativity. The Walnut Finish Oriental Stand is included. 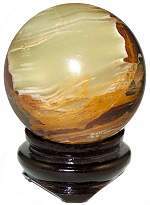 Spectacular Petrified Wood polished spheres with small geodes are bursting with fantastic colors and patterns that only Nature can conceive. It is a Bio-Gem, like Amber or Coral, the wood is replaced by deposits of Agate, Quartz or Opal, either singularly or combined. Petrified Wood has a metamorphosis from a biological life cycle to a millennial earth cycle. It symbolizes union with earth rhythms, historic legacy and understanding time cycles. Beautifully polished 50mm spheres from Madagascar. The Wood Sphere Stand is included. 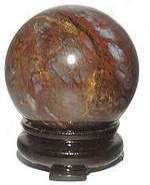 Exquisite "AA" quality Pietersite spheres from Namibia have superb color and polish including an iridescent chatoyant sheen. This stone is often used for upscale jewelry. It's healing energies are said to aid clarity by dispelling illusion and fostering a courageous "walk in life". The Wood Ball Stand is included. 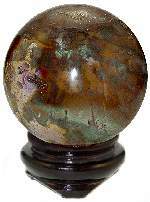 Rare Polychrome Jasper 50mm spheres from Madagascar have a superb lustrous polish with a dazzling mix of hues, from burgundy and gold to muted greens and earth tones. 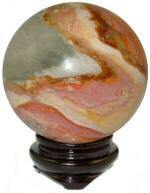 Jasper is a mystical stone of justice, said to be highly protective and to rectify unjust circumstances. Jasper is an opaque form of Chalcedony and has been a stone for kings and shamans. Beautifully polished 50mm spheres from Madagascar. The Wood Ball Stand is included. Fabulous "Fool's Gold" Iron Pyrite geode spheres from Peru are masterfully polished to expose the natural crystals growing in the stone. Pyrite is a polymorph of Marcasite. It is said to be a very potent protector, shielding one from intense negative energies. The Wood Ball Stand is included. 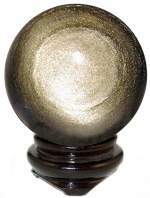 Iron Pyrite is well known as fool's gold and is a polymorph of Marcasite. Meaning that it is the same substance, but with a different molecular structure. It is is known as a very potent protector, shielding one from intense negative energies. 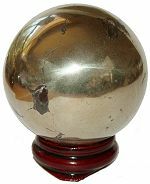 These Iron Pyrite spheres have a shiny gold sheen polish and come with a Wood Ball Stand. Rare Blue Opal possesses a brilliant blend of blue shades complimented by darker highlights. This stone is said to provide one the courage to speak freely. It also was used to help with making new connections and reading people. The Wood Ball Stand is included.